It gloomed, it loomed, it was something, it was somebody, the prodigy of a personal presence. Rigid and conscious, spectral yet human, a man of his own substance and stature waited there to measure himself with his power to dismay […] His planted stillness, his vivid truth, his grizzled bent head […] his queer actuality of evening-dress […] and polished shoe. No portrait by a great modern master could have presented him with more intensity, thrust him out of his frame with more art, as if there had been ‘treatment’, of the consummate sort, in his every shade and salience […] The hands, as he looked, began to move, to open; then, as if deciding in a flash, dropped from the face and left it uncovered and presented. Horror, with the sight, had leaped into Brydon’s throat, gasping there in a sound he couldn’t utter, for the bared identity was too hideous as his, and his glare was the passion of his protest […] It came upon him nearer now, quite as one of those expanding fantastic images projected by the magic lantern of childhood; […] the roused passion of a life larger than his own, a rage of personality before which his own collapsed, he felt the whole vision turn to darkness and his very feet give way. 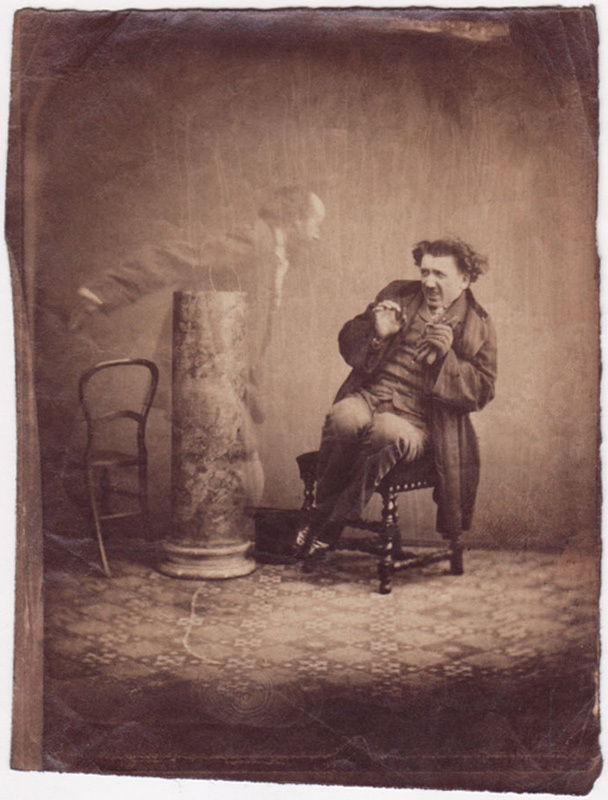 The only piece of information that we have about this photograph, a small albumen print, just 108 x 83mm, using the double-exposure technique and dated from 1860–1865, is that the frightened man flinching back from the presumed spirit is the painter Charles Sillem Lidderdale. Born in 1830 in Saint Petersburg, he painted portraits of demoiselles in landscapes, some forty of which were exhibited at the Royal Academy between 1856 and 1893. Unfortunately, due to serious issues with his eyesight, he had to abandon watercolour, and instead opted for oils. When I first saw this image in the collection of the London-based dealer in nineteenth-century photography, Paul Frecker, the horror on Lidderdale’s face immediately reminded me of that of Spencer Brydon, the protagonist in Henry James’s 1908 short story ‘The Jolly Corner’, when he has an encounter with the ghost of his alter ego. In particular, I had the impression that the ‘intra-diegetic’ looks, to borrow a term from Victor Burgin, exchanged between the subjects of the photograph were charged with the same feelings of threat, impotence and regret that overwhelmed Brydon before the spectre of his double. This obsession with what Brydon might have been and what fantastic ‘development of [his] own nature [he] mayn’t have missed’, develops as ‘a strange alter ego deep down somewhere within [him]’. Alice Staverton, a long-time lover of Brydon, who indulges him in his whimsical and paranoid thoughts, is the first to recognise a presence in the house, which in turn elicits his famous response: ‘Oh ghosts – of course the place must swarm with them! I should be ashamed of it if it didn’t’. Through Miss Staverton, we discover that the ghost in question is precisely Brydon’s alter ego, and when she accuses him of being an egoist he replies: ‘He isn’t myself. He’s the just so totally other person. But I do want to see him […] and I can. And I shall.’He compulsively nurtures his desire to catch in the face of his alter ego ‘the strangest, the most joyous, possibly […] the proudest, duplication of consciousness’. When Brydon eventually sees the ghost, he finds it completely incompatible with his own self-image and, as the only possible means of psychic escape, denies it to be himself. The tale ends with the certainty of its own unsolvability, like a failed detective story, leaving open the question of whether or not Brydon’s identity is inextricably intertwined with the ghost’s. Going back to the photograph, we could read it as portraying what the German philosopher Gotthold Lessing, in reference to painting and sculpture, calls the ‘pregnant moment’, in this case the dramatic moment of the painter’s last unaltered vision before his eyesight deteriorated, the vision of a terrifying spectre, possibly appearing to steal his eyesight and compromise his career as a painter. What I find particularly intriguing in pairing this ghost image with James’s quote, besides the strikingly vivid analogies between the situations that they both describe, is the link between James’s explicit reference to painting, when he states that ‘no portrait by a great modern master could have presented’ Brydon’s ghost ‘with more intensity’, and the fact that the subject of the spirit photograph, a painter of portraits, would have trouble with his eyesight, precluding his chance to become a great modern master. My idea here is precisely to test James’s fear that a too-detailed image will overwhelm the retina of the reader, killing his or her imagination, and disturbing James’s own verbal images. Does the spirit photograph portraying the dramatic moment of the painter’s encounter with the ghost annihilate the power of James’s literary art, his most ambitious ‘garden’? Since it’s impossible to pose the question to James himself, I leave it to the reader to decide. Henry James, ‘The Jolly Corner’, transcribed from the 1918 Martin Secker edition, Amazon Kindle e-book. Originally published in The English Review of December in 1908. Shalyn Claggett, ‘Narcissism and the Conditions of Self-knowledge in James’s ‘The Jolly Corner”, in The Henry James Review (2005), 26:2, p. 189; Daniel Mark Fogel, ‘A New Reading of Henry James’s ‘The Jolly Corner”, in Critical Essays on Henry James: The Late Novels, edited by James W. Gargano, Hall, Boston, 1987, pp. 190-203 and Eric Savoy, ‘The queer subject of ‘The jolly Corner”, Henry James Review (1999), 20, 1-21. Ralph F. Bogardus, ‘Photographs as Symbols in the New York Edition’, in Pictures and Texts: Henry James, A. L. Coburn, and New Ways of Seeing in Literary Culture, UMI Reserch Press, Ann Arbor, 1984, p. 182.